Sarvshakti the 8th part of Sarvnayak Series, this part was released after a long gap and Readers had wait long for this part. Readers were awaited eagerly this comic for 2 main reasons. The first, final competition between Doga and Yoddha, and off course the result of this competition. And second, the arrival of Nishachar. But, they were disappointed by the both. On the other hand, several parallel events which are going on along with the Sarvnayak competition, are still remain unanswered. And this part has also raised several mysteries and questions. 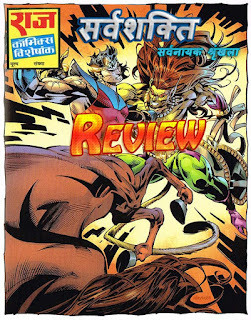 So let's begin the discussion on comic Sarvashakti. And let's try to figure out, what happened and why? Is it correct? If not, then why not? Let's quickly take a look at these things that happened in 90 pages of Sarvashakti. Some action was expected from Nishachar, but he doesn't fulfill the expectations. Doga and Yoddha compete for each other in Arm wrestling match. There was nothing special, anyone can easily predict the outcome of this competition, and my guess was right. Shambhook deceitfully provides additional strength to Doga, and guess how? From his own sweat. What a smelly idea it was. Well, at first I was also thinking something like Parmanu, but later I came to know that it is just sweat. Parmanu and Prachanda start fighting once again. And shortly both behaves like sensible kids, and settle their problem with a little talk. A humble request to both of you, Please stop increasing the pages of the comic unnecessarily. Good job Bhediya, you deserves applause. Really smart guy, I like the way he binds Ashwaraj hands and feet with his tail and tied saddle on him. Bhediya has proved it a second time in Sarvnayak series that he is a half animal and half human but he has a full brain. Right now just one inaccuracy had come out of Sarvmanthan, and the condition of ICU legends (Invasion Control Unit) began to be worse in such a short period. Sagham has lost the Trimund as it was a toy he found at the fair, no problem we'll buy another one. Now what should I call you Sagham? You lose things that you have in your hands and plans to rule the world and sinners. Prakriti already knew all about the kshudra planets and she created his daughter Pryawa to tackle them. Despite this, Prakriti doesn't help Pralayanka and Dhananjay. And when her brother Prkrat was going to finish them both, then suddenly she activates her daughter and stops Prkrat from doing so. Damn, why not she stopped Prkrat earlier? By doing so Prakriti had could save 4-5 pages of this comics. Man, what is it Supreme Head, Nagraj's enemy? What happened to him? He looks like a "Poor Head" rather than "Supreme Head". All's well that ends well, the last 2 pages of the comics are lot more effective. Why? My dear our beloved Banke is there. The entry of Gamraj and his part in the story is nothing special. But really, I'm happy to see the both Bankelal and Gamraj in this comics. 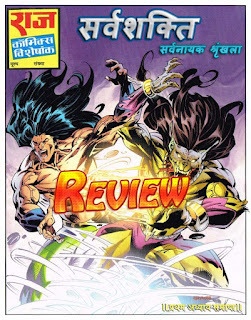 In terms of story, the story of Sarvashakti comics has certainly grown, but the journey was not so much exciting or spectacular. Someone has said it very true, “the journey is more important than the destination”. And the journey must be entertaining, otherwise, I do not think we will reach the destination. For the story, I would say in a single sentence. "The story is entertaining, but it cannot be said a perfect entertainment". We have read 7 separate but parallel stories in this comics. 3 of which are brand new (last 3, Yantrik Raktabeej, Gamraj and Bankelal). In the remaining 4, the ongoing competition in Kaalrann made some progress. While rest of the stories are almost in the same position, just a slight increase. Yes, a few more characters and some new twist have been added to these stories. In these 7 stories, a few parts are good and they are Nishachar (somewhat), the main competition, Trimund (a little bit) and Vishaalgarh, but rest of the parts are disappointing. If you are having difficulty in remembering the story of all eight parts of the sarvnayak series. Then I would advise you to buy Chyawanprash as soon as possible, why? Oh man, to strengthen your memory, because we are all going to need it very soon. Bankelal and Gamraj have arrived in the story, then surely Fighter Toads will soon be join the club too. And as we have seen the advertisement page of the upcoming comics Sarvaagman, now we all know that the old forgotten superheroes are also returning. Why this series was named "Sarvnayak", it is now fully understood. "Sarvnayak" series is now justifying its name. So now, How much further the story will grow? What might be next in the story? Who else will join the story in addition to all these Superheroes? I'm leaving it to you, you can get an idea yourself. But one thing is sure, just forget about the conclusion of Sarvnayak series at the moment. Now from here it's interesting to see, how the writer will adjust the upcoming superheroes in the story, especially the Comedy Kings. How he would brought these superheroes and the comedy heroes together into the ongoing serious story without damaging the seriousness of the story. It would be fun to watch. Now let's move towards the artwork, artwork is fantastic in the opening chapters of the comics. Especially the pages of Nishachar and Bhediya-Ashwaraj. The artwork in Doga-Yoddha pages is not that much good. The last chapters of the comics are totally opposite to the starting chapters. Just except the last 2 pages of Bankelal, the rest of the artwork is totally disappointing. Especially the "Yantrik Raktbeej", the entire artwork of this chapter is very disappointing. 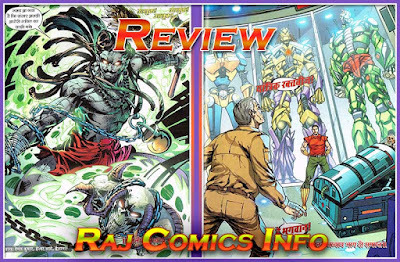 The remaining chapters Trimund and Dev Shapath, artwork of both of these chapters is average and needs to be improved. Oh yeah, the last page of Trimund chapter devoted to Agori is great, artwork is beautiful. Dialogues are average but still, they are fine. Humorous, spicy and satirical dialogues are perfectly placed in the serious ongoing story and they are great. Some dialogue of Parmanu are funny and full of satire, which are very important in terms of entertainment. But as I say again and again, everything has its limit. Once this limit has been superseded, then the result would definitely be negative. In Sarvnayak series I noticed that Parmanu is becoming long tongue. Humor is good but in a limit. This is my personal opinion that perhaps Parmanu is being tried to make "Desi Tony". The dialogues of Parmanu are becoming like a wild bull, and this can spoil his good heroic image. Well anyway, dialogues in the comics completely correspond to the personality of the characters, and totally matched with the circumstances. Dialogues are powerful, emotional, reflective, sincere and spicy too. Overall, the dialogues are written in a good manner. 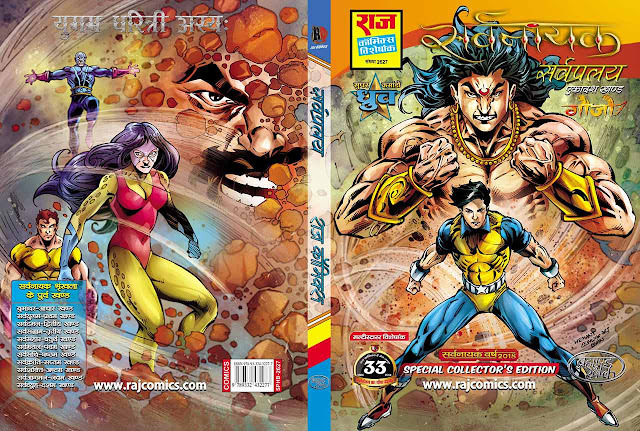 In Nishachar comics, Doga and Dhruva were overcome Nishachar after a hard struggle. And in this comic, the same Nishachar was easily handled by Anthony alone and that too in just 10 frames. Of course, Anthony and his cold fire (Thandi Aag) both are powerful, but even then this encounter should have shown a little more detail. Page 74 frame 2, a crown of green leaves is on Prkrat's head. But on the very next page, the color of this crown changed into red. And before these scenes, there is no crown on the head of Prkrat. Minor mistake in drawing. Page 75 the first frame, Prakriti is shown wearing a crown of leaves on the head. This crown is shown in red color, while it was supposed to be green. Before these scenes, this crown has been shown made up of green leaves. Another minor mistake in drawing here. Page 89 first frame, King Luna is shown wearing something red (probably jacket) over his yellow shirt. But on page 91 his entire yellow shirt is missing, he is shown wearing a red jacket only. Oh forget the shirt, it seems the whole King Luna has been changed on this page. Whoa, we got one more minor mistake in drawing here. Page 89, the complete electronic hand of Supreme Head is missing here. Damn, we have caught another small mistake in the drawing here. The strength of Shakti's fire form, advance Science of Probot, Max Kotino, and Professor Nucleolus all are proved wasted and useless. Garvgreh was built by the joint efforts of all these people. And furthermore, titanium was used to build this Garvgreh. And now you can see that how much strong, durable and reliable this Garvgreh has been proved. Got to see very quickly. A pillar of Titanium-containing Garvgreh could not last for two days. Pillar of a sector next to Gamraj's sector suddenly broke down, and it was containing titanium. It was unbelievable. The story has been kept very clean in this part, readers will have no difficulty in understanding. As well as each chapter received enough pages. The artwork is great, just except a few parts and pages. 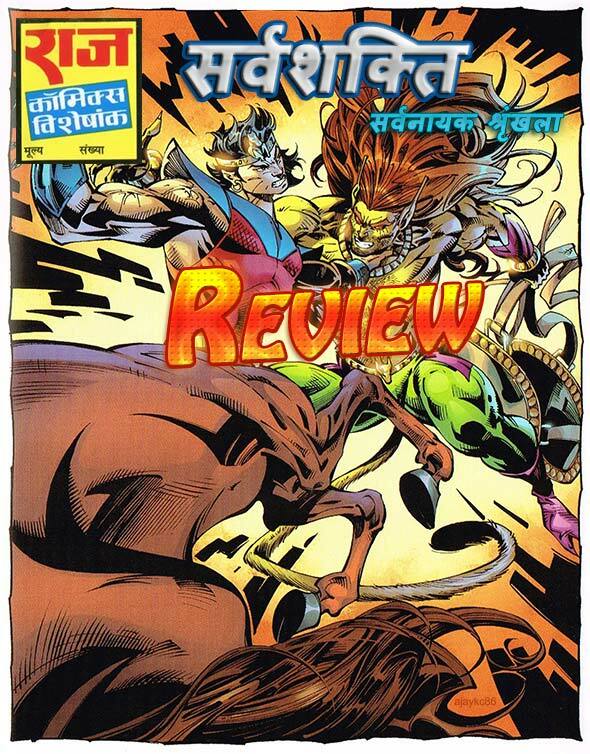 Nishachar, Bhediya-Ashwaraj, Trimund, and Dev Shapath (except a few frames) and Bankelal, artwork is spectacular in these parts of the comics, fully commendable. A few pages of some chapters are created fantastic, especially the single-frame pages. Such as, page number 2 (The arrival of Nishachar), Pages number 39, 48 and 54 (Bhediya vs. Ashwaraj) and page number 68 which is dedicated to Agori. All of these pages are drawn very well. Nice to see the both of Bankelal and Gamraj in Sarvnayak series, glad to see the comedy kings once again. Readers will surely need them in this serious ongoing story. And hope readers will surely like their comedy, as always. And finally, overall, Sarvashakti is slightly higher than an average comic. It is entertaining and worth the money. Please do not forget to rate the comics, the rating panels are present at the top and bottom of the post. The next parts are expected to be even more wonderful. Tata Bye-bye guys, see you at the next review. सर्वनायक श्रृंखला का आठवां भाग सर्वशक्ति, श्रृंखला के इस भाग ने पाठकों को लंबा इंतज़ार करवाया। इस कॉमिक्स में पाठक सबसे ज्यादा जिसके लिए उत्सुक थे वो थी, डोगा और योद्धा के बीच अंतिम स्पर्धा यानि के प्रतियोगिता का परिणाम। और दूसरा तमस के बेटे निशाचर का आगमन। लेकिन दोनों ही जगह पाठकों के हाथ निराशा ही लगी। दूसरी और सर्वनायक प्रतियोगिता के साथ चल रही अन्य घटनाओं के जवाब तो नहीं मिले, लेकिन इस भाग ने और कई रहस्य और सवाल जरूर खड़े कर दिए। तो आइए चर्चा करते हैं कॉमिक सर्वशक्ति पर, और जानने की कोशिश करते हैं की आखिर क्या हुआ? क्यों हुआ? सही हुआ? नहीं हुआ तो क्यों नहीं हुआ? Writer koun hai bhai ?? Aapke yahi shabd humaara JANOON hain. Thanks for the encouragement and appreciation. When is Sarvaggaman review coming out? And where is the story headed? How many more parts before it concludes? Bro you have too many questions. Actually, every true fan should have. 3. Only time or the RC team can answer this one. A lot of us care bro. You are doing a fantastic job. Keep it up. RC should recognize your efforts. Bhai please aur review daalo.Puraani comics ke bhi chalenge.mujhe aapka review style bahut hi pasand hai.Jabardast detailing hoti hai.Ek movie reviewer style ka.Main kai baar check karta hun but aajkal review nahi dikh rahe>ab Agar RC new set nahi daal rahi to puraani comics ke hi kariye.Pahli baar comics pe koi jabardast writing dekhne ko mili hai.